By Linda Abraham, founder and president of Accepted.com and co-author of the soon-to-be released book. MBA Admission for Smarties: The No-Nonsense Guide to Acceptance at Top Business School. After fifteen years of working in MBA admissions, I have been hard at work on a book about… you guessed it: MBA admissions. The first part of the book lays out the four key steps necessary to choose the programs that will maximize your chances of acceptance. 1. Determine your post-MBA goal. You won't be able to find an MBA program that supports your goals until you determine what your goals are. Think deeply about what you want to do, which industries interest you, and where you'd like to live. Once you have the answer to those three questions, let that answer guide you as you proceed through the application process. Yes, your goal can evolve later, but for now it will be a trusty guide. 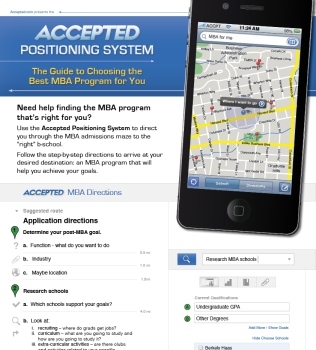 And having a clear goal will actually enhance your a attractiveness to most top MBA programs. 3. Evaluate your qualifications. Weigh your academic competitiveness, work experience, and community service against those of the students accepted at the schools you are interested in. Look at your academic stats, the quantity and quality of your work experience, your community service, and any diversity elements, which admittedly can be difficult to identify. Then assess your competitiveness as objectively as you can. 4. Target programs. After completing steps 1-3 above, you should have enough material to begin compiling a list of target MBA programs. You should apply to 4-8 programs that support your goals and that are likely to admit you. It’s that golden overlap between what you want and what you believe the schools want that you’re aiming for. The intersection of interests represents the solid foundation for a success MBA admissions process. Follow these steps and you should arrive at your destination – the perfect MBA choices for YOU. Please Check out our cool infographic for the map to your perfect MBA choices. And good luck! View the original Accepted.com blog post or others like it. When is the right time to get an MBA? Different people decide to pursue an MBA for very different reasons. For many, earning an MBA presents the opportunity to obtain the skills necessary for making a desired career-switch. Others have already begun building experience in their industry of choice, but see the MBA as a means of accelerating their careers. Some are current undergraduates who have a clear vision of their ideal career path, have demonstrated leadership potential, and know the value of the MBA. Others are entrepreneurs who want to tap into the resources that an MBA program can provide and begin to work on their own ventures. Regardless of where you may fall on that scale, one of the most difficult tasks is deciding when to pursue an MBA. So, how do you know if this is the right time to get an MBA? First, identify your career goals. It will be easier to visualize them if you actually write them down. You can do this on paper or in a type-written document. Even writing an email to yourself will suffice. Next, calculate which percentage of those goals would be facilitated by having an MBA. If the result is the majority, then you should have a pretty good idea that it is time to start exploring MBA programs more seriously. Be sure to consider the costs and the benefits of beginning this journey. Yes, taking yourself off of the job market for two years to obtain an MBA will require a significant investment of time and resources. On the positive side, you will be two years closer to achieving your goal. If that enticement is enough to ignite your determination, then now is the time to begin your due diligence. Research the structure, size, and locations of the various MBA programs. Visit classes. Tour the campuses. Get a feel for the culture. Identify the programs which have strong recruitment track records and professional clubs in your field of preference. Reach out to managers and/or professors for potential recommendations. Connect with current students, administrators, alums, and local business professionals. The Forte Forums also provide an excellent opportunity network with women in business who can provide valuable insight from their own experiences. If after you have done your due diligence and identified the best program fits, you feel as though you are already on the fast-track to accelerating your career, keep up the momentum and get those applications started! · Decision & Risk Analysis: How do you make an optimal decision about an uncertain future? In LBS’s Decision & Risk Analysis course (soon to be called Data, Models & Decisions), we learned frameworks and Excel-based models (like PrecisionTree) that I’ve been using to help Shell decide its long-term strategy in the face of changing climate regulations. · Organizational Behavior & Management Accounting: How do you structure incentives to achieve business objectives? One helpful tool came from our core course on Managing Organizational Behavior. Vroom’s Expectancy Theory argues that employees expect: (1) that their effort will enable them to achieve performance objectives (e.g. increase sales); (2) that achieving this objective will result in a reward (e.g. promotion); and (3) that the reward will be something they care about (e.g. status). Sounds obvious, but just think how easy it is for a link to be missing: you are held accountable for results you can’t control, you enable your client to achieve a huge win but don’t get rewarded, or you are compensated with cash when you are really dying for more vacation days. · Marketing: Great, so you have your idea – now how do you sell it to a diverse group of stakeholders? Market it! In our Marketing core and the simulation MarkStrat, we learned about the 5 stages of marketing penetration: (1) Make people aware of your idea; (2) help them consider how they might use it; (3) follow up to convince them that they should prefer it over the alternatives; (4) make it easy for them to “buy” into; and (5) make the experience of using your idea so good they become an loyal advocate. I actually didn’t come to London Business School for the academics – I came for London, a career move, and the network – but the classes have been amazingly useful. See -- I’ve even become a loyal advocate! When I was considering schools, I found only three I'd be happy with, given my criteria. So I knew I had to make those three applications count. But I worried about not being the "ideal" candidate, having no finance or consulting background, and having worked remotely for a tech startup while enjoying a fairly significant career as an actress. Yet, as I began start the application process, I realized that these schools didn’t want a cookie-cutter "ideal" candidate anymore. Rather, they were looking for diverse, passionate, and interesting people. The essay questions alone attested to that: Stern asks you to introduce yourself to your classmates, using practically any medium under the sun. Columbia asked to relate a significant life experience and explain how it shaped who you are. Anderson asked for an audio or video essay where you reveal something unique about yourself. These schools are practically begging for applicants to show off their true interesting selves. So instead of panicking about my non-traditional background, I let my true colors show. Of course, my story still made sense, but I didn't shy away from mentioning my background in acting and how I was eager to share some improv exercises with classmates looking to improve their presentation skills, or how I planned to revamp a club's website with my knowledge of CSS and HTML. And now that I'm in school, I still use these unique, albeit non-traditional, skills to my advantage. Professors try hard to incorporate a variety of perspectives into their classes, and I love having a lot to say when we're talking about Google's growth from scrappy start-up to market leader. There are still plenty of my classmates from those "traditional" backgrounds in finance and consulting. But even they have diverse interests and aren't afraid to show them. One former banker friend has a blog about digital media. Another finance friend fosters stray and feral kittens. These passions are what make my classmates fantastic, and these classmates weren't admitted by accident. So make sure you let your true self shine through your application. You just might be rewarded with admission and some new friends who can show you how to brew your own beer, take you sailing, or pull a quarter from behind your ear. 1) DEFINE YOUR CAREER GOALS (short- and long-term) and how an MBA fits into your plans. Make sure an MBA is a necessary step because it is a big commitment and you want to make the right choice. 2) TALK TO PEOPLE who have gone through the application process. 3) PICK THE SCHOOLS YOU APPLY TO CAREFULLY. Find the best “fit” programs for you, which may not necessarily be only the “top” schools. 4) ATTEND ADMISSIONS EVENTS – Forté Forums, MBA Fairs, admissions visits to your city. You may end up meeting important admissions officers or future classmates. 5) DO YOUR RESEARCH. Review the schools’ websites and talk to current students, alumni, officers of students groups you’re interested in, friends, and friends of friends to get specific information about each program to include in your application. 6) Make sure you know the schools’ DEADLINES and each component you need for the application – Official GMAT score, transcript(s), recommendations, essays, and application. 7) GIVE PLENTY OF LEAD TIME TO YOUR RECOMMENDERS (1-2 months). Discuss your reasons for pursuing an MBA so they can write meaningful letters on your behalf. 8) If possible, VISIT EACH SCHOOL you are applying to. Talking to students and getting a feel for the school in-person is invaluable and also shows the school you are interested. 9) PUT IN YOUR TIME when creating your “story” in the essays. Write essays that only you can write and be confident in yourself. Make them as interesting and personal as possible. The admissions committee reads a lot of essays so make yourself stand out! 10) Have a few key people REVIEW YOUR ESSAYS before you submit them to make sure you answer the questions, that your overall story makes sense and your grammar and spelling is perfect. To find my dream school, I needed to know what my dream was. So I took my time listing out what I'm looking for in terms of program focus, school’s strength, and career services relative to the industry of my interest; its clubs and student community; its surrounding community; potential financial aid; its geographical location, and its weather, etc. I also ranked those criteria I had in order of importance to me and thought about the workload needed to prepare applications. After having my list, I started my research. I first started with popular rankings such as the Business Week, the Economist, or Net Impact’s Business as Unusual etc. to have an idea of which schools are highly regarded in my area of interest and shortlisted them into 5 schools that I thought I would have time to research in detail. I also browsed schools’ websites, joined discussions on MBA forums, and talked to current students. Now I had a better idea about the schools’ programs and communities, I knew the level of competition to get into the school of my dreams. I put together a matrix of information, worked out a timeline and to-do-list, identified the resources I had to execute that plan, and managed its execution so that I could spend my two years at the school of my dreams. Finding my dream school was not a step but a process. After a fantastic orientation program I had last week and excited interactions with classmates and faculties, I am now certain that I am at the school of my dreams.